John Souttar celebrates scoring Hearts' second goal of the day. 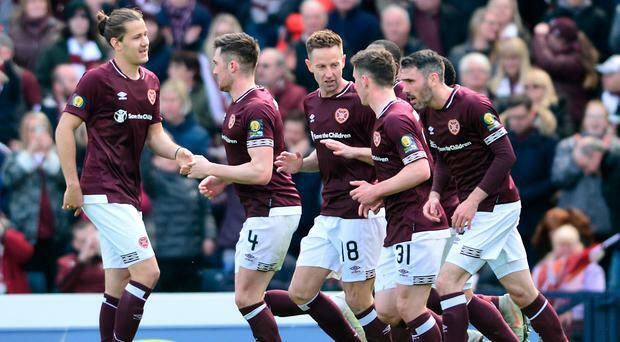 Northern Ireland duo Bobby Burns and Michael Smith helped Hearts booked their place in the William Hill Scottish Cup final. Former Glenavon star Burns, 19, only made his first league start for the club in the derby defeat to Hibernian last week and put in a sufficiently impressive display to start at left-back again this weekend as his side smashed Inverness 3-0 at Hampden Park. At the opposite side of the defence, ex Ballymena United player Smith held his usual starting berth at right-back. Former Coleraine winger Darren McCauley came on as an 83rd minute substitute for Championship side Caley with the game already gone. Michael Smith of Hearts celebrates at full-time.